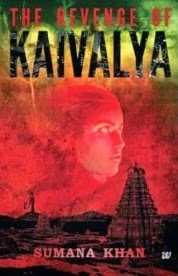 The next morning, somehow, â€˜Kausalyaâ€™ had transformed to â€˜Kaivalyaâ€™. I did not remember coming across the name in any of my previous research. Curious, I looked up what â€˜Kaivalyaâ€™ stood for. And was fascinated. Â Â Read More …….. The Revenge of Kaivalya, probably another attempt my another author to write a paranormal thriller, probably not worth it â€“ were my initial thoughts even as I prepared myself to begin reading the book. The whole South Indian setting appealed to me and that is the primary reason I volunteered to do a review. The narrative is simple and clear, the story progresses steadily and keeps an optimum pace not at all boring the reader, the story is completely engrossing and would want you to keep reading and finish the story quickly, yet you would not want the book to be over so soon. If I had not read this book, I would not have ever understood how through good story telling you get spooked as if you were watching a movie on a big screen.. probably this book would scare you more because you are left at will to imagine the faces of the characters and you will realize that it is possible to get chills down your spine even without the sound effects. The main characters are all female and the men play the supporting roles to perfection.The author describes the characters so vividly that they remain with you even after you finish reading the book. The story telling is mpressive and the fear is just there..from the first page till the end… commendable work from a first time author Sumana Khan. The Revenge of Kaivalya is one book that I would most definitely recommend to those who like paranormal stories and also to those who don’t, who knows, maybe this book will change your outlook! I like horror stuff and watch a lot of movies .. I guess I will have a look at this one for sure .. I got my copy yesterday! After reading your review, cant wait to rad it now . Thanks for a fab review, Bhavya!